Samuel “Sam” Hyde Harris was born in Middlesex, England, in 1889, and immigrated to the U.S. with his family in 1904, settling in Los Angeles. Harris enrolled in classes at the Los Angeles Art Students League and the Canon Art School, where he studied with the Impressionist painters, Frank Tolles Chamberlin (1873-1961), Hanson Duvall Puthuff (1875-1972), and the early modernist Stanton McDonald-Wright (1890-1973). Harris began working with Puthuff in 1906 and the two became life-long friends. Harris’ early works particularly show a strong influence from Puthuff, with similarities in their fluid brushstrokes, and plein air subject matter. At 14 years of age Sam Hyde Harris was already a productive commercial artist. A 1903 letter of recommendation from Andre & Sleigh, stated that, "We have the pleasure in stating that Samuel Harris (aged 14 ½ years) has given every satisfaction during the 8 or 9 months he has been engaged in our Artists Department." After working at a variety of jobs in advertising art, Harris developed a reputation for doing excellent work and opened his own commercial art studio by 1914. His commercial art business received a boost in 1920 when he was hired by the Atchison and Topeka Company to work on their poster advertising. Later, Harris designed Van de Kamps Bakeries well-known windmill logo and the original lettering. The list of his clients also included the Southern Pacific, Union Pacific and Santa Fe Railroads and the Pacific Electric or “Red Cars." While creating promotional posters for the Union Pacific and Santa Fe Railroads, Harris began exhibiting his plein air works. His first recorded exhibition was in 1920 with the California Art Club. He continued exhibiting his work regularly throughout his life. Pursuing his art career Sam Hyde Harris created many paintings on his outings around the San Gabriel Valley and San Pedro harbor. 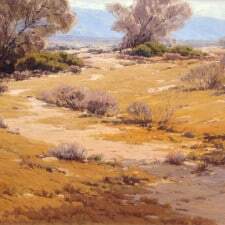 In the 1920s and 30s, he and Hanson Puthuff went on numerous painting trips together to Arizona and California, traveling in pursuit of atmospheric landscapes. Aside from landscape painting, Harris also painted scenes of the working person’s life, never the elite. Although he decried the notion of “painting to please the public,” Harris won popular acclaim for his paintings, which sold well and won abundant recognition from his peers. He was the recipient of more than 100 awards and purchase prizes bestowed by colleges, community organizations and leading art associations. He is listed in the Who’s Who in American Art and Who’s Who Western Division. At the age of 55, Harris divorced his wife of 27 years, Phoebe Mulholland, and married Marion Dodge, a UCLA librarian whom he met in an evening art class, and moved his home and commercial art business to an area of Alhambra known as Artists’ Alley. Through the 30s and 40s, this area was home to artists Jack Wilkinson Smith, Clyde Forsythe, Frank Tenney Johnson, Eli Harvey, and Norman Rockwell who painted in Alhambra in the summers. In its heyday, Artists’ Alley attracted many leading western-genre personalities and artists, including Will Rogers, Charles M. Russell, Edward Borein, Maynard Dixon, and James “Jimmy” Swinnerton—together they shared many painting trips to California’s Mohave Desert (California Art Club Newsletter, Summer 2007, “Pioneers of Artists’ Alley” by Elaine Adams). The spirit of the Old West and the tradition of desert painting at Artists’ Alley was conducive to Harris’ own interest as an artist. Sam Hyde Harris was a member of the seminal California Art Club, the Painters and Sculptors Club and the Laguna Beach Art Association. In the 1970s, a renewed and growing interest in his paintings led to the organization of numerous exhibitions. Key among those were “Design 1910” at the Pasadena Center (1974) and “Southern CA Artists 1890-1940” at the Laguna Beach Museum of Art. Also in 1976 Harris had a one-man show at the San Gabriel Fine Arts Association and in 1977 a one-man show in Alhambra opened only four days before his death. His work is in the collections of virtually every major institution that collects California Impressionism, including the Irvine Museum and Fleisher Collection as well as major private collections across the United States. He was the subject of a major retrospective at the Pasadena Museum of History in 2007 and 2008 and a large book was produced to accompany the exhibition.